The “if you can eat the whole thing, it’s free” challenge is as American a tradition as apple pie. Restaurants across the country love trying to lure in customers with the promise of a free steak dinner if those customers can eat it in some time limit that is significantly less than the number of days required to burn off the equivalent amount of calories. But why just settle for free? A restaurant in Tokyo is offering a massive bowl of ramen and, if you can finish the whole thing, the eatery will pony up over $400. 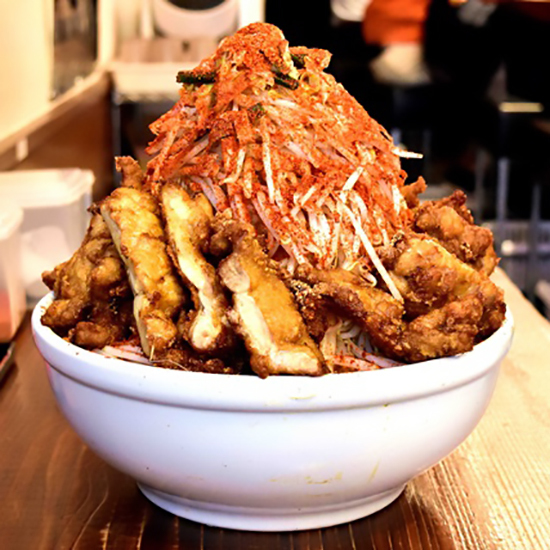 According to Kotaku, Japanese ramen spot Umakara Ramen Hyouri is giving out dough to people with massive appetites able to finish the restaurant’s “mega serving” of noodle soup. This huge ramen boasts numbers like four servings of noodles and 8.8 pounds of bean sprouts all sitting in about 24 ounces of broth. And to spice up the challenge, the chef adds spice – a serious covering of chili power – on top. The meal costs about $26 to order, however, diners have a chance to eat their way to financial redemption: If you finish the whole thing in 20 minutes, you’ll be paid 50,000 yen – or about $438. You could practically buy a lifetime supply of Top Ramen with that much cash. And good news for slower eaters: You can still make 30,000 yen (about $263) if you can get through the bowl in the only slightly more practical time of 30 minutes. Also, don’t worry about throwing up: That’s only a 10,000 yen penalty. This crazy ramen eating challenge has garnered renewed interest since being covered by the Japanese website My Navi. It reports that in the past three years that Umakara Ramen Hyouri has been offering the mega serving ramen, nine people have finished it. I’m assuming none of those nine people were allowed to go back and do it again – because why bother working when you can make a quick 50,000 yen guzzling ramen every day?